State surveillance categories were determined using three classifications: high incidence, neighboring, and low incidence. 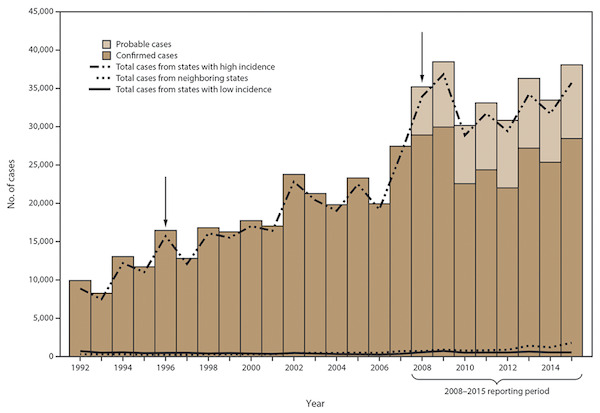 States with an average annual incidence ≥10 confirmed Lyme disease cases per 100,000 population were classified as high incidence, states that share a border with those states or are located between states with high incidence were classified as neighboring, and all other states were classified as low incidence. Arrows indicate notable changes in case definitions. The case definition was revised in 1996 to recommend a two-step testing method and in 2008 to increase specificity of laboratory evidence of infection and to include provision for report of probable cases. This entry was posted in Medicine and Society Data Watch on November 15, 2017 by Genevra Pittman.